That's a very interesting picture, and I can understand that the red halo around NGC 7317 is important, since it demonstrates that this seemingly "quiet" galaxy has been interacting with the other members of Stephan's Quintet for a long time. Therefore, Stephan's Quintet is also an older group than has been generally assumed. Stephan's Quintet. Photo: Bob Franke. 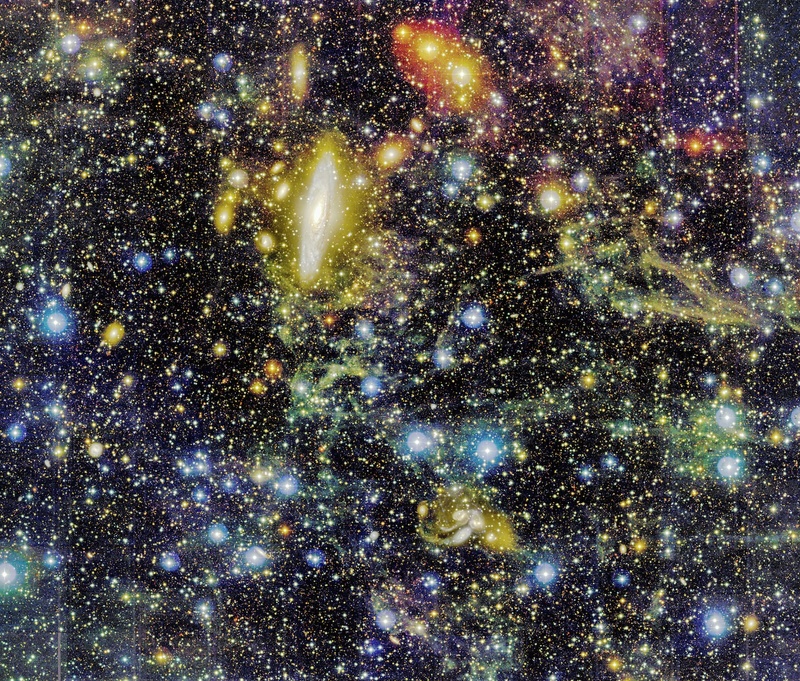 What I find most interesting, however, is the blue-green star stream apparently emanating from NGC 7320, which is actually not a member of Stephan's Quintet at all, but a foreground dwarf galaxy which we accidentally see along the line of sight to the compact group of galaxies far behind it. The shape of the star stream that seems to emanate from NGC 7320 parallels the shape and direction of the even more prominent tidal tail from NGC 7319 "above" it. You can see both star streams, although faintly, in the picture by Bob Franke. To me, the tidal tail apparently emanating from NGC 7320 makes it look as if NGC 7320 was a true member of the interacting group of galaxies. But that is not so, as is clear from the Hubble picture of Stephan's Quintet. Note how "grainy" the disk of NGC 7320 is, how faint and barely yellow its small bulge is, and how tiny its nucleus is. It is clear that these properties of NGC 7320 are quite different than the properties of the galaxies it appears to interact with, and that is only possible if NGC 7320 is smaller and more nearby than the other galaxies. But still, that tidal tail that seems to emanate from NGC 7320 and which parallels the shape and size of the tidal tail of NGC 7319 really makes it look as if NGC 7320 a true member of Stephan's Quintet, although that is impossible. Can anyone explain? Ann wrote: ...But still, that tidal tail that seems to emanate from NGC 7320 and which parallels the shape and size of the tidal tail of NGC 7319 really makes it look as if NGC 7320 a true member of Stephan's Quintet, although that is impossible. Can anyone explain? I would assume that 7320 had a drive-by interaction with another galaxy that is not visible in the frame of these photos. I don't know how else it would get a tail that long. As for the direction of the tail paralleling that of 7319, coincidence, surely. Thanks for your reply, Rob! Yes, that sounds plausible. However... both tidal tails, one from NGC 7319 and one seemingly from NGC 7320, point at a small spiral galaxy which can be seen at far left in the picture from CFHT. The small spiral galaxy is NGC 7320C, and it is fairly generally assumed to be a true member of Stephan's Quintet. The tidal tail from NGC 7319 to NGC 7320C is seen as proof that these two galaxies have been interacting. Yes, but what about the tidal tail that seems to emanate from NGC 7320? That tidal tail seems to point "even more directly" at NGC 7320C, which is particularly obvious when you look at the picture from CFHT. The idea that a true tidal tail from NGC 7320 would just happen to point straight at a background galaxy that is truly interacting with Stephan's Quintet seems like too much of a coincidence to me. What I'm wondering is if the tidal tail that seems to belong to NGC 7320 really comes from one of the true members of Stephan's Quintet, but the foreground object NGC 7320 blocks the "beginning" of this tidal tail and prevents us from seeing where it comes from. 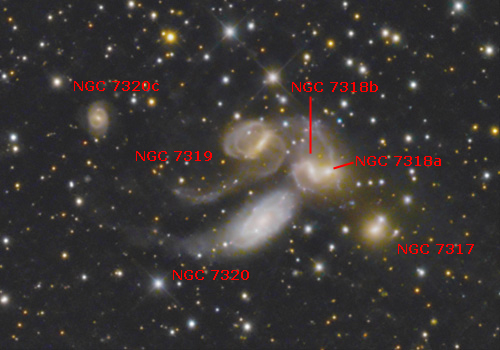 If this is correct, there would be two tidal tails from the classic members of Stephan's Quintet, both curving in the same way and pointing straight at NGC 7320C, but the foreground object NGC 7320 hides vital parts of one of the tidal tails. How about that hypothesis? Is it possible? Ann wrote: What I'm wondering is if the tidal tail that seems to belong to NGC 7320 really comes from one of the true members of Stephan's Quintet, but the foreground object NGC 7320 blocks the "beginning" of this tidal tail and prevents us from seeing where it comes from. Thanks, Chris! I have really been wondering. What I'm wondering is if the tidal tail that seems to belong to NGC 7320 really comes from one of the true members of Stephan's Quintet, but the foreground object NGC 7320 blocks the "beginning" of this tidal tail and prevents us from seeing where it comes from. A later paper I found placed its connection to NGC 7318a and/or 7318b. So perhaps this remains uncertain. What isn't uncertain (in terms of Ann's question) is that the structure is part of whatever is going on in Stephan's Quintet, and has no association with NGC 7320.